This entry was posted in Uncategorized and tagged Abby, Addy, Brigitte, Ruth by mountainmullins. Bookmark the permalink. How wonderful to own TWO ‘AI’ Studio Dolls, Abby, blonde hair and brown eyes and now Addy, with her brunette hair and blue eyes, which delightfully replicate your mother and grandmother’s own personal colouring’s. I have also noticed their different hand shapes and which I intend to look up and read about in the Sasha information books, when time allows. Addy’s new Ruthsdolls Tartan dress so reminds me of my first BI Studio Girl’s original outfit…if you can remember it? They definitely look to have already become the very best of friends. Yes, yes and yes, on your excellent memory of my ex studio doll, Erin. Addy is just wonderful, a perfect compliment to Abby as Kendal said. I just love her face, as you know she has been a big influence on the SCW upcoming project. I love that she now has a compilment of outfits at her disposal, she is a treasure for sure. Congratulations on your newest girl Ginger, she is a lovely tribute to your Mum. Seems she has a very good friend already as well. How lovely, she could be a portrait doll of your Mother. Your new girl is amazing; such lovely eyes. She is a perfect companion to Abby. The portrait of your mother is such a wonderful keepsake. 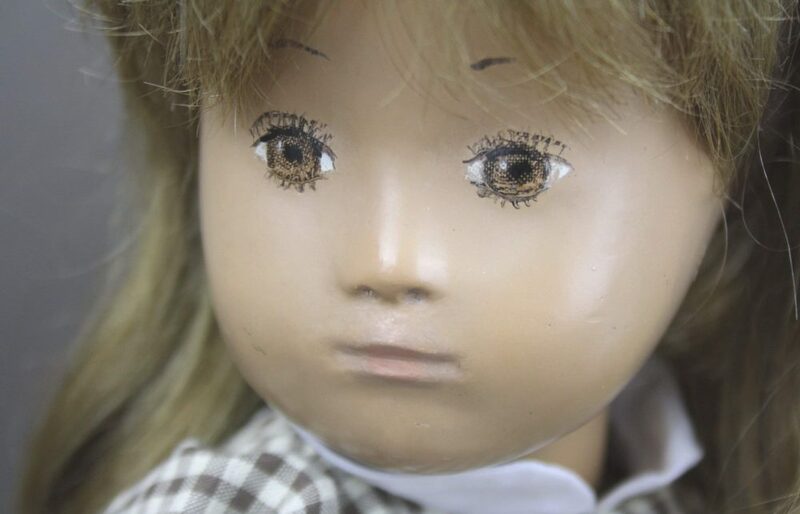 What a lovely doll, and yes, very similar to your dear mum. I love the painting from the photo too. I really like the yarn hair on these dolls, it works very well with the cloth. And such pretty outfits too. Thank you dear Sharon. I like the yarn hair too. I think it really makes the dolls very special. I am glad you like the outfits and they are really fun to dress. What a lovely tribute to your Mum and Grandmother is your new girl Addy, she’s also a lovely edition to your Cow Creek Sasha’s. Two A1 girls are a treat to see together thank you for sharing her with us.